Fresh from continued successes after the FINA World Championships and Olympics, the highest-profile speakers in Aquatics are confirmed to speak at the 4th FINA Swimming Coaches Golden Clinic. Day 1 has Zhu Zhigen discussing ‘The Path to Become a Champion’. He is in a unique position to do so, having coached to Sun Yang – the first Chinese man to win Olympic swimming gold, and the first male swimmer in history to earn Olympic and World Championship gold medals at every freestyle distance from 200–1500 metres. Next up is Nigel Redman, former Rugby international and current Head of Performance Team Development for British Swimming, who is ideally qualified to speak on ‘Competing as Part of a Training Programme’. His role is to support the development of British Swimming coaches and the wider performance team on their journey to Tokyo 2020. He also co-designed and delivered Coach Development Programmes for the English Institute of Sport (EIS). David Lush, Australian Swimming Coaches and Teachers Association ‘Coach of the Year’, discusses ‘Insights into Coaching a Developed Swimmer’. He’s the man who guided Emily Seebohm to World Championship, Olympic and Commonwealth gold medals. Over the past three years he has had a Gold Medallist at every significant international event. Who better to talk about ‘Keys of Long-Distance Training’ than French Swimming Federation OWS Program Director Stéphane Lecat. Having been a top-level swimmer– 10-time French champion and medal winner at European and World Championships – he has coached athletes at every level to medals and championship titles in the 5km, 7.5km, 10km and 25km. John Atkinson, National High Performance Director/National Coach for Swimming Canada speaks about ‘Long–Term Athlete Development’. This has been a crucial part of his role since joining Swimming Canada in 2013 and overseeing athlete performances and achievements in Canadian, Pan Pacific, World and Olympic Championships. In Rio, the team had a 200% increase in medals won. Xu Guoyi, who has made a huge contribution to the sustainable development of Chinese Swimming, speaks on ‘Adapting Coaching Style to Different Environments’. He has been coach to many famous and successful swimmers since 1994, including Ye Shiwen who became the youngest swimmer to win two Olympic gold medals in London 2012. 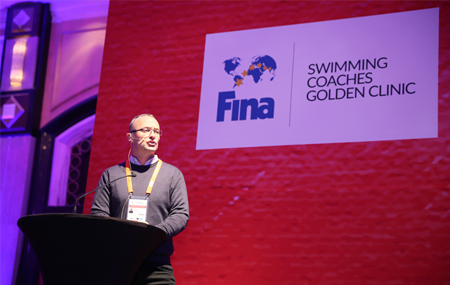 Miguel Angel López, FINA Training Center Head Coach, is perfectly placed to speak on ‘Coaching Heterogeneous Groups’. Having worked with some of the world’s best swim coaches and technicians all over the world, including Spain, the US and Asia, there is not much he doesn’t know about his subject. The 4th FINA Swimming Coaches Golden Clinic takes place 8–10 December 2018 at the Intercontinental (Hangzhou, China) and is a key highlight of the FINA World Aquatics Convention. Other highlights of FINA’s Convention include the Aquatics Conference, Exhibition and extensive networking programme.